NEWS: OPETH Frontman - "Metal Fans Are Close-Minded"
In the vast and endless realms of power metal, it doesn’t really get any better than Rhapsody of Fire. The always symphonic and grandiose power metal band has been releasing epic after epic since 1995, and 18 years later they still manage to drive their fans crazy over their music. November 22, 2013 marked the release of their 10th full length studio album, Dark Wings of Steel. With an obvious epic name such as this, to say this album is oozing with power metal goodness isn’t even an accurate description. 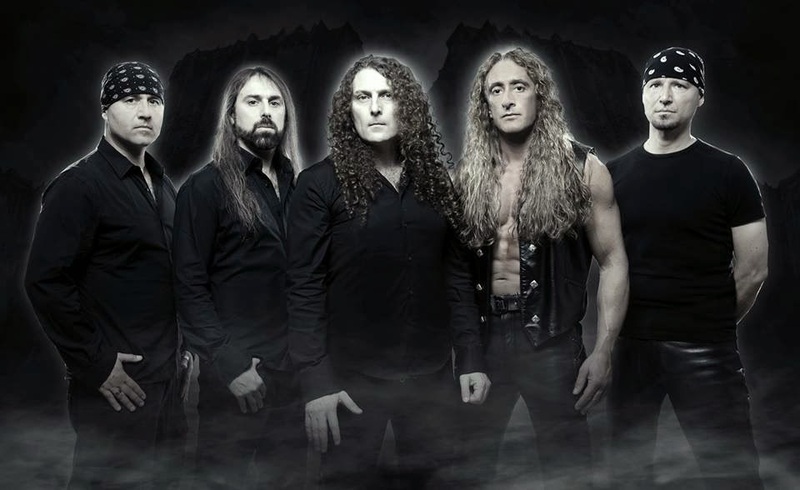 Rhapsody of Fire has released yet another genre defining work of art that fans everywhere can’t seem to get enough of. While I tried to set aside my expectations and tellingly high hopes for all this album could be, I couldn’t help but notice this release is extremely keyboard and guitar driven, and a lot less produced than what was expected. That certain “bigness” the band had been known for has calmed down into a more classic metal tone. Everyone knows of the now infamous Luca Turilli split from the band as he formed Luca Turilli’s Rhapsody. Always a fan of major theatrical themes in the music, Luca’s leaving was both exciting (new project!) and scary (Rhapsody of Fire?!). 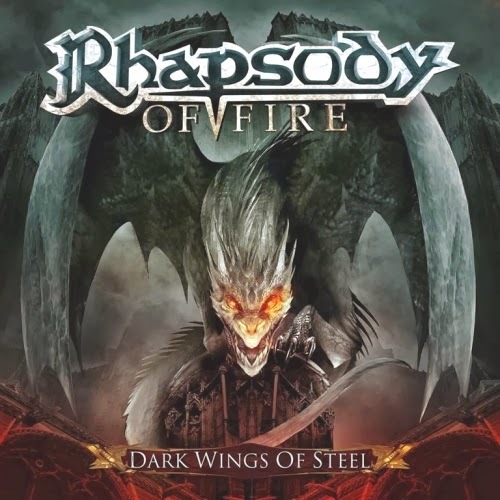 While LT’s Rhapsody can continue making those massive sounding, highly produced epics I thoroughly enjoy, Rhapsody of Fire was able to step backwards and focus on the heavier side of things. As such, comparing the production from Symphony of Enchanted Lands II and Power of the Dragonflame to this new release would be a very difficult thing to do… so I will do everything in my power not to do it. The second that “Rising From Tragic Flames” kicks in from the short but sweet introduction “Vis Divina” I knew I wouldn’t be disappointed. The riffs are strong in this one. The conversations between keyboard and guitar are beautiful, but it easy to see who is writing the songs here. Keyboardist and original band member, Alex Staropoli, shines as the lead songwriter, but the keyboards are extremely prominent in the mix. They play a huge role in moving the songs along and bringing drama to the otherwise expected heavy metal, but they drown out everyone else too often. Particularly in the slower songs like “Tears of Pain” where the thrashing riffs from Roberto De Micheli are on the back burner. The choir-like ethereal sound of the music is still there, but very toned down. Fabio Lione seems to be soaring above the vocal effects, and rightfully so as he is THE signature voice of the band. Tracks like “Silver Lake Of Tears” and “A Tale Of Magic” are exactly what I would expect from Rhapsody of Fire with a fast galloping tempo, dramatic keyboard lines, and heavy, heavy triplets from the guitar and bass. Not surprisingly they are my favorite songs on the album, and Fabio’s aggressive vocal style sends chills down my spine every time I hear it. The chorus of “A Tale Of Magic” especially is just unbelievably catchy and forces me to sing along, though I could never dream of sounding as heavenly. After all the wonderfully organized chaos in the triplets and galloping tempos, there are the beautiful songs like “Custode Di Pace” or “Peace Keeper” where raw emotion and passion is laid out for all to hear, as the album slows to it’s most beautiful climax. I can’t help but think of “Lamento Eroico” but likely because it is another beautiful, slow song sung in Italian (all we need is a flutist in the intro). Dark Wings of Steel is not a flawless release, as a few of the tracks are far too repetitive and predictable. While “Angel Of Light” has a cool rhythm to it, I continually find myself skipping it about a minute in. This is the case for “Fly To Crystal Skies” and the title track. They feel rushed, and the true passion and emotion behind the song is hard for me to genuinely feel. That moment where the song builds and builds, then unleashes into this soaring chorus… just isn’t really there, which is rather disappointing. That being said this is a release fitting of the Rhapsody of Fire name and should be treated as such. I have always been pretty insistent on the fact that Rhapsody of Fire is the definition of power metal. They are in fact, the example I always turn to when people ask me what the genre is all about. That fact will never change, even as the band takes a step or two back on the theatrics and those epic 10 to 15 minute long songs that we all love. This is definitely a good direction to hear the band going in, because as much as I love Luca Turilli, I really don’t want to hear two bands doing the exact same thing.